The show kids will enjoy at prices mums and dads will love! After the success of our first ever tour James Richards Circus is back on the road with our fabulous 2019 production featuring amazing new artists from across the globe aswell as some familiar faces from 2018 we've definitely tried our hardest to pack as much fun into a live bigtop circus performance as possible. 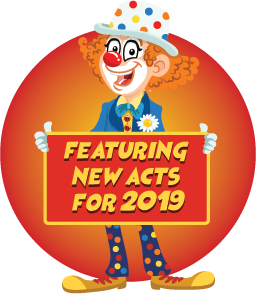 James Richards Circus will visit more than 30 venues showcasing it's exciting world of fast paced circus direct to your doorstep. 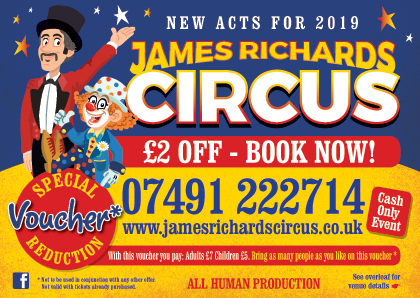 With our very own blend of comedy, thrills, spills and glamour we really have a production for all the family.Whether you see our big top on your local village green or town sports field your be guaranteed a great family show, with seats priced at just £9 adult, £7 children and concessions plus further discounts available you can't go wrong with James Richards. So sit back, relax and enjoy the show. Please contact us with regards to making your booking as we have limited seating. Once tickets are purchased refunds cannot be made,but can be exchanged for an alternative performance.